“Cuddled by slopes slipping down to eight acres of private parkland and manicured gardens, the 21 bedroomed Villa Feltrinelli is tucked away secretly on the western shores of Lake Garda at Gargnano. 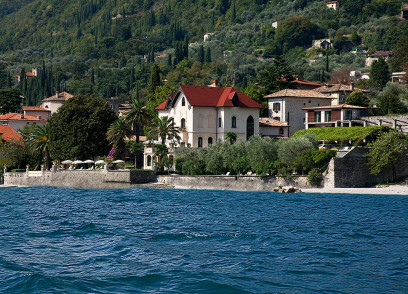 Visible only from the lake, the Villa rises above the shoreline like an enchanted fairytale castle. Gold and terra cotta horizontal stripes resemble the layers of a creamy cake topped off with crenellations, decorated with octagonal towers and studded with star-shaped windows. Steps sweep up from the lake, past marble pillars, under a regal balcony and into the Villa. Built by Milanese architect Alberico Barbiano di Belgioioso in 1892 as a summer home, this neo-gothic mansion clearly befitted the family of timber magnate Faustino Feltrinelli whose fortunes also included Italy’s largest and most respected publishing house. The Villa’s 21st century reincarnation bears all the hallmarks of their spectacular private house, updated for the appreciation of the contemporary upmarket traveller – one who can easily imagine the Feltrinellis inviting them to use their splendid home, in their absence, with supremely attentive staff on hand to tend to their every need. The favourite European hotel of some of the most demanding people on the planet, Feltrinelli is a baby-grand with full pedigree and punch. 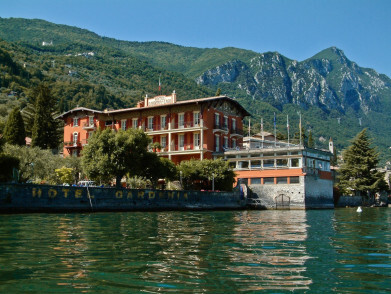 Set in eight-acre grounds on the western shore of Lake Garda, this exclusive hotel is located in a historic 19th-century villa. Interiors have been lavishly restored and feature frescoed ceilings, Venetian mirrors and Art Nouveau lamps. The 21 rooms are decorated with antiques and custom-made furnishings.